I admit it – like most gun culture involved individuals in America, I also got way too caught up in building an “ultimate” AR-15. While I didn’t go as wild as some, I definitely spent way more money buying and trying different setups until I settled on my current “Goldilocks”configuration. I use and shoot the hell out of that AR – it’s my SHTF “gotta go!” rifle – but I’ve figured out with actual use that the rifle just has a lot going on for occasional range use, training, and scouting/small game hunting. It’s heavy for an AR, to boot. 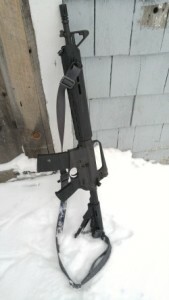 The basic rifle uses a Windham Weaponry 16” heavy barrel SRC upper, modified with a Troy low-profile gas block, 13” Troy Alpha rail and aluminum Sig Sauer flip-up BUIS. The lower has a Magpul MOE grip and a Magpul ACS stock, both stuffed to the gills with extra springs and pins, small sample tube of CLP, a spare firing pin, and a full complement of CR123 batteries for the 1000-lumen Fenix PD35 TAC light. With the rubber-armored Aimpoint Comp ML3 red dot optic and steel LaRue M68 QD mount, the rifle weighs over nine pounds with a full 30 round magazine and BDS sling. It’s set to go for a SHTF event and is a very capable, reliable, great-shooting rifle. You could ask almost anyone and probably get the reply that it has everything one might need on an out-the-door grab-and-go SHTF AR platform. But does this AR have things I don’t absolutely need (besides weight)? Since building that SHTF rifle, my mind has been drifting occasionally to a “KISS” (Keep It Simple, Stupid! ), rifle that is lighter, has no frills, and just works for a variety of uses and missions. I recently assisted my father with assembling a rifle that he dubbed his “ULWC” (Ultra LightWeight Carbine) that utilized a lot of really high-end lightweight parts and a dash of simplicity to create a nice, functional AR that tips the scales at under 7 pounds with a micro red dot optic and 20-round P-Mag. I wanted to straddle the line between the weight of my father’s ULWC, the utility and mission of Doc Montana’s “Katrina Rifle”, and what I had built already. Nothing battery-powered, (though retaining the capability of mounting a light) just tried and true simplicity. I’ve had a Colt Match Target Sporter HBAR for years, and I never really shoot the rifle anymore due to its competition-designed setup: it is a standard AR-15A2 configuration, with a 20” very heavy barrel, non-removable rear “carrying handle” adjustable sight, and fixed rear stock with added weights. The rifle shoots great, but its 1:7 rifling rate of twist means that it doesn’t group my preferred 55-grain bullet handloads very well – the 1:7 twist spins the fast-moving little pills too quickly, and the rifle grouped badly with 55-grainers as a consequence. I didn’t want to stockpile another bullet in the 69-75 grain range and develop another handload for a rifle that didn’t have the capability to mount an optic optimally, so the rifle sat in the safe and gathered dust for a long time. However, one day I was talking with my brother about possible upcoming AR builds, and he said, “why don’t you just throw a collapsible stock on your Colt?” A light bulb went off. I have built up a cadre of friends and local shops who were very capable of excellent AR builds and had all the tools I hadn’t accrued yet….so indeed, why not modify the Colt? It possesses all the basic upper and lower receiver ingredients for a great KISS rifle – it just needed a different barrel and stock configuration. I rooted through the couch cushions for extra change and set to work once I had the funds. The configuration I knew I’d go to was one I’d had in mind for years: Dissipator, baby. I remember being quite young – probably before my teens – and perusing through the many stacks and stacks of gun magazines my father had accrued: my earliest firearms education. I remember seeing an a picture of an AR-15 that still sticks with me – it looked like a mean-looking chopped-off standard AR-15A2; and really, that’s what it was. Later in life, I found that the then-Maine-based company, Bushmaster Firearms, had put a name to the design that Colt had pioneered years ago: The “Dissipator.” A classic Dissipator is a standard AR-15A1/A2 with the barrel – usually 20” on a standard A1/A2 – lopped off to a handier 16” length. The flash suppressor sat just beyond the fixed tower front sight and full-length rifle handguards, giving a stubby, businesslike appearance. But even in my now long-gone younger ages, I knew that the rifle had a longer sighting radius for better accuracy, while boasting the handier CAR-15 shorter overall length. Original Dissipators had issues with reliability; they had a full-length rifle gas system on a carbine-length barrel. Gas impulses and resulting short dwell time were funky and the guns had a habit of not cycling properly unless the gas ports were opened up significantly. Modern Dissipators usually utilize M4-pattern barrels and carbine-length low-profile gas systems under full-length rifle handguards, with the fixed tower front sight not being utilized as a gas block, as per the usual. Today, things have come full circle. After the A3/M4 AR variant reared its head, sprouting its myriad spawn and video game experts, shooters started to realize that the extra handguard length meant more rail room for more goodies and sling mounts. It also lead to a longer sight radius for any attached sights, and with the modern arm-extended “C” clamp method of holding the rifle, more space to muckle onto the forward end of the rifle and not get your phalanges cooked medium rare. You’ll see many modern builds are actually de facto Dissipators – short barrels with full-length handguards/rails growing around them, and sights that are placed almost to the muzzle. Hey, if it works, people will figure it out eventually, right? But I’d figured out long ago that it looked purposeful and damned cool. And I was gonna get one, dammit. Or, y’know, in this case I’d build one. Okay, so I had a Colt rifle and the entire interwebs to help me figure the best way to modify it. Really all I needed was a barrel, appropriately-lengthed gas tube, and a collapsible buttstock. I’d had the receiver extension, end plate, buffer spring, and carbine buffer kicking around already, waiting for a build. I sourced a black milspec Magpul CTR stock from the local Cabela’s, and converted the lower from a fixed A2 stock to a 6-position telescoping rear stock one evening after dinner. Mission one complete. Now for the upper receiver modifications, which were going to require more digging to make sure I did things right. I searched the catacombs of online sources for a couple days, looking for the proper barrel for my build. I definitely did not desire another heavy barrel; nor did I want a flyweight barrel and its walking groups. Finally, I found that my local boys at Windham Weaponry do indeed offer Dissipator setups – I could have bought an entire completed Dissipator upper receiver, but settled on just the barrel and gas tube to replace the 20” heavy barrel that was on the Colt. In the Dissipator models, Windham Weaponry offers a heavy barrel setup, as well as a stepped, lighter M4-pattern barrel. I opted for the latter, and was 100% confident I’d have a great barrel; I’ve personally toured the Windham Weaponry facility, and their quality control is second to none. Every person who works there is fiercely proud of their product and what they represent. As stated before, my other AR build has a W-W upper, and with a good field rest, that rifle will keep 4-5” groups at 200 yards with no issues if I do my part behind the Aimpoint. Windham Weaponry offers the ability to purchase directly through their website and I could have installed all the hardware, but I wanted to support another local business. I called on an old schoolmate, Jeff Furlong at Furlong Custom Creations in Raymond, Maine, to order the parts and assemble them to my upper. I’d had a custom kydex holster made by Jeff years ago, but had never had any rifle work performed. He has a stellar reputation for his builds here in the area, so I called on him to help with the build. Jeff helped me sort out what I wanted and needed, and he got to ordering the barrel and necessary accoutrements from Windham Weaponry. While he was at it, I asked him to source a set of black rifle-length MOE MLOK handguards from Magpul, and a new charging handle. He had a BCM Mod 4 charging handle in stock, so we threw that on the pile of parts. I dropped the upper off at Furlong Custom Creations, and less than a week later, I got the message that the parts had arrived and the new parts were assembled on the upper. Huzzah! I buzzed up to Furlong Custom Creations to collect my upper. Jeff remarked that it looked “badass” with the Magpul handguards, and I was inclined to agree. Though aesthetics aren’t exactly the only thing we aim for with our ARs, you know we all smirk inwardly with unabashed satisfaction when another gun guy tells us our rifle looks “badass”, or some variation thereof. I probably would have skipped back to my truck if it wasn’t for the icy driveway. Once home, I reunited the old receiver mates and assembled the newly transformed upper onto the Match Sporter lower. The end result was, in my eyes and hands, delightful. The weight sits just a bit further forward than a standard M4, and the handling qualities are excellent. The initial handling time I got with the rifle, comparing it to its fully decked-out brother, made me like the Dissipator more and more – maybe there really was something to this simple, lightweight thing. The first range trip was short – I barely got it on paper at 50 yards before the Maine 4th Keyboard Commando Brigade showed up at the pit with their AKs and .45 Glocks and started performing breathtaking 7.62 drum dumps and even occasionally hitting their Bin Laden targets. I packed up and headed home before the cops showed up. I finally got a few minutes to do some accuracy work while on my lunch last week, and the results were very good. With Federal 55-grain FMJBT ammunition, I was able to keep 5-shot groups to 1” or so at 50 yards offhand. Benched groups at 100 yards with the same Federal load hovered in the 2”-3” range – adequate for the purposes I need. I’ll try a few different factory loads and also try a handload – but for all intents and purposes, I’m happy with groups this size from an open-sighted rifle. My old Winchester Model 54 in .30-06 shoots 2-3” groups at 100 yards with open sights, but will cloverleaf three rounds at the same range when scoped – so I know that the larger groups at long range are due to my aging Mark 1 eyeball’s capability, and I’m fine with that. I accept it, anyway. Though I’ve only run about 300 rounds through the rifle thus far, I have been very happy with the package and the performance. Reliability has been flawless – though one really can’t gauge long-term results from just a few rounds downrange. I didn’t want – or really, need – to add a bunch of crap to this rifle; I wanted to maintain the KISS principle to the best of my abilities. Light weight and no-frills are the core concepts in this build. In my mind’s eye, I only needed two accessories: a good sling, and the ability to mount (and dismount) a light. For the sling, I ordered a Magpul MLOK-compatible QD sling mount, and attached the circular mount at the 10 o’clock position, as far forward as I could place it. The Magpul CTR stock already had a quick-detach sling swivel mount built in, so I sourced a pair of Midwest Industries Heavy Duty QD sling swivels from Amazon. The space in between the swivels was filled with an adjustable Wolf Grey Blue Force Gear Vickers Combat Application sling to keep the whole rig in place on my body. For those of you who haven’t tried a Blue Force Gear Vickers sling, they are phenomenal and highly recommended. 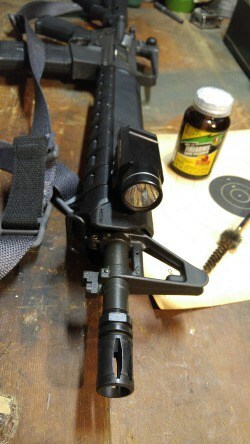 For illumination, I obtained a 3-slot MLOK picatinny rail attachment point, which I mounted at the 2 o’clock position, also as far forward as was allowable. The small, simple rail is just the right size to mount a Streamlight TLR-1, which can be activated by my support hand fingers without adjusting my grip. Simple, easy, tough…and with enough illumination power for what I expect to use the rifle for. 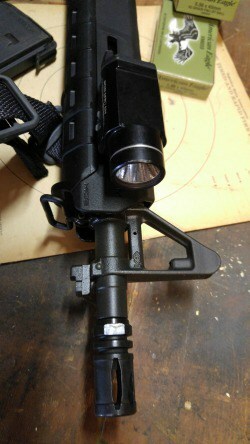 a three-dot tritium sight set to replace to stock A2 adjustable sights, as budget allows – but with the Streamlight mounted, the need for the illuminated sights is negated mostly. If I don’t go with tritium sights, a finer post front sight will find its way on the rifle. An Odin Works extended magazine release is definitely on the list; they are a vast improvement over the stock magazine release, and I install them on all of my AR platform rifles. A Magpul MOE Enhanced Trigger Guard will also be installed in the future to allow for improved access to the trigger with gloved hands. They are more smoothly contoured as well, and don’t have a tendency to shave skin on my fingers as badly as the stock sharp-edged metal one. I saw a screaming deal for a BCM extended trigger guard, so that was ordered and installed on the rifle instead of the Magpul part. While some may say the need for this rifle may be vague or non-existent, it fills a very vacant hole in my lineup. I’m very fond of running guns that are sans optics unless I need them; I like the lighter weight and better handling qualities…a good aperture sight setup is all I need for 90% of my rifle use. I’m comfortable and pretty quick on target using the built-in, non-removable sights. For a few bucks, I can always drop some cake on a new flat top upper and have the Dissipator parts swapped on, once my eyes finally give out (I’m fighting it as long as I can, dammit) and I require an optic to keep my rounds heading in the right direction with anything resembling a modicum of precision. But, what will I do with this rifle? I’m glad you asked. Like the aforementioned Katrina Rifle engineered by Doc Montana (check out his article here for a similar rifle concept that is different in execution), I built a rifle around an idea that requires a simple, light, rugged, and above all, reliable rifle that is capable of security detail/protection, hunting, and scouting. Light weight is essential so that the rifle can be on my person perpetually if the situation demands it. In a true disaster or SHTF event, having a lightweight rifle as a force multiplier may be the difference between life and death – and if the rifle is so heavy or obtrusive that you leave it at home standing in the corner, it is of no benefit. This KISS rifle is also a second primary rifle, so that I may outfit my teenaged-but-larger-than-me son with an effective rifle in case of severe emergency and extra security is required. I also wanted a platform for my KISS rifle that was easily serviceable, with parts readily available, either aftermarket or from salvaging “found” guns if needed – the Colt fit the bill flawlessly in that department. However, since the Colt is an older “pre-ban” (is that still a bragging point anymore?) rifle, it has larger .169” trigger/hammer pins, not the Milspec standard .154” pins. This necessitates a couple spares taped to the inside of the Magpul MOE grip….just in case. A complement of easily-lost detents, springs, and pins also reside in the grip cavity along with a shortened 1/16” hardened steel pin punch and a small sample tube of CLP. I like being able to effect small repairs and lubrication in the field if necessary, but big parts replacement, if required, and deep cleaning can be carried out at the home/BOL armorer’s bench. The rifle will likely stay at the homestead, but remain ready to fulfill its duties with a ready complement of four loaded (and regularly rotated) and ready-to-rumble Magpul P-mags for immediate danger work, or a couple five-round magazines with a small-game/varmint handload in case I don’t feel like taking my Walking Around Rifle for a jaunt in the woods. This KISS Dissipator (KISSipator?) fulfills all the basic requirements I was looking for when I started building the gun in my head. I got the Dissipator I’d been dreaming of for 20 years, and was able to tailor the long lusted-after rifle and its few accessories to fill a hole in the SHTF arsenal, all while not overloading the rifle with gadgets and battery-powered weights. Mission accomplished. The Dissipator configuration is a great choice if you’d like the longer handguards for mounting and grasping real estate, but without the added cost and/or hassle of free-floating rails. Really, if I didn’t want to retain the capability of mounting a light to the gun, I could have left the standard A2-style handguards on the rifle, mounted the sling to the standard swivels, and had a great rifle for even less money. As it stands, the cost for the barrel and gas tube assembled to the Colt upper, BCM charging handle, Magpul MOE rifle-length handguards, Magpul CTR rear stock, Blue Force sling and mounts, and the MLOK attachments is $407.00 – much less than the cost of a new, high-quality rifle (with no accessories! ), even in this heyday of the AR rifle and aftermarket parts glut. And keeping it simple? That’s a personal choice. I like having a rifle that is 100% effective at its intended job without any additional tactical detritus that weighs the rifle down and requires a larger stockpile of batteries. I was pleasantly surprised at the utility of this rifle, even without all the gadgetry installed. The fixed rear sight A2 platform is the ultimate in platform simplicity and ruggedness, and may even be the direction you want to go in if you’re looking for these same qualities in a SHTF rifle. What are your thoughts on this setup? A waste of a good Colt, or the right direction to go in? Sound off in the comments with your thoughts if you have a minute to share.